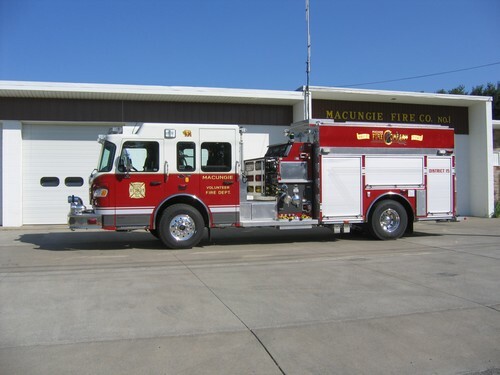 2006 Smeal Top Mount Rescue / Pumper mounted on a Spartan "Diamond" 6 Man Chassis, with a Cummins ISL 370 Hp Diesel Engine with Exhaust Brake, Allison EVS 3000 Transmission, other features include a Waterous 1500 GPM Single Stage Pump with 1000 Gallons of Water. Aluminum Body with Full Depth, Full Height Compartments with ROM Roll Up Doors, and LED Strip Lighting, Custom Shelving and Tool Boards. Hydraulic Ladder Rack with storage for a Stokes Basket. Onan 10Kw Diesel Generator with Two (2) Electric Cord Reels, Two (2) 1000 Watt Push-Up Quartz Lights, and Four (4) 500 Watt Tripod Lights. Hosebed for 1000' of 5" Supply Line, and 600' of 3" Attack Hose, with a Diamondette Hosebed Cover. Coffin Compartments above the Driver Side Compartments.